Solitary cilia occur in motile as well as in non-motile fibroblasts of the periodontal ligament. The cells which moved with the erupting incisor are bipolar and oriented with their long axes parallel to the tooth surface. In cross section these cells have a flattened appearance. Cilia are localized in close vicinity to the nuclear area and show a definite orientation with respect to the transverse cell axis. The frequency of occurrence of this organelle was estimated from the percentage of diplosomes containing a basal body. Analysis of the composition of the paired structures indicated that at least 70 per cent of the fibroblasts are ciliated. 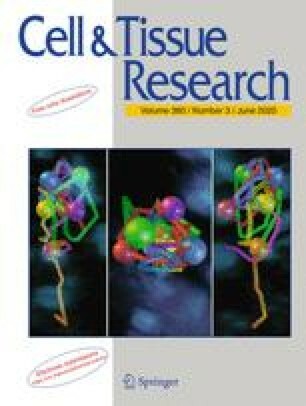 The frequency of cilia in motile fibroblasts does not differ from that in non-motile cells suggesting that the presence of this organelle is not directly associated with cell locomotion. We would like to thank Prof. Dr. A. van den Hooff and Prof. Dr. J. James for their helpful comments on the manuscript. We are also indebted to Mr. C.E. Gravemeyer for careful handling of the photographic material and to Mr. A.D.P. Heijboer for preparing Fig. 4.